Upright: Inspiration, ideas, discovery, limitless potential, free spirit. Reversed: Newly-formed ideas, redirecting energy, self-limiting beliefs, a spiritual path. The Page of Wands shows a young man holding a long staff in both hands as he looks inquisitively at the green leaves sprouting from the top. His tunic is emblazoned with salamanders, a mythical creature associated with fire and transformation. The Page stands still, with his staff firmly planted on the ground, suggesting that while he is inspired by the potential growth represented by the sprouting staff, he has not yet taken action on this inspiration. In the background, the landscape is barren and mountainous, implying that this Page has the gift of being able to find growth and potential in the most unlikely places. He is so energised by his ideas that he can make anything happen and isn’t limited by his circumstances. With the Page of Wands, you are inclined to give anything and everything a go. You embrace the opportunity to start out on a new journey or project and see where it takes you. You do not necessarily have a solid plan in place, nor do you really know where you are headed, but you are excited about the possibilities. You have a gift for dreaming up new creative ideas unfettered by the burdens of everyday life. Nothing will get in the way of your dreams! 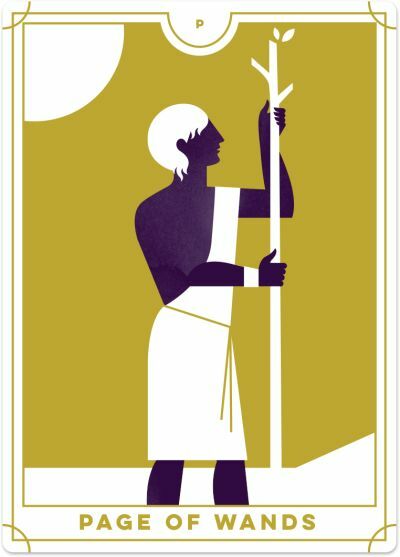 And while the appearance of the Page of Wands indicates that you are experiencing creative restlessness, notice that the Page is standing still and his staff is firmly planted on the ground – he is not going anywhere just yet. You still need to take your creative spark and ground it down into reality so that it is ready to be implemented in the physical realm. You may need to map out your strategy, or you may need to test your ideas or create a few experiments before committing. It could be helpful to run your thoughts through a filter so that you only act on those most aligned with your broader goals. The Page of Wands reversed suggests that you can feel the stirrings of something new emerging within you, but you don’t know how to turn it into action. You may have the seed of an idea or a general sense that something new is coming, but you are yet to express it in the world. You do not need to take action yet – in fact, doing so may be detrimental since this idea is very much in the early stages of formation. Just ‘play’ with the idea and let it grow, develop and blossom into what it wants to be. Do not force it; sit in the creative void and allow it to open up to you. On the other hand, the Page of Wands reversed can mean that you tried many new ventures or projects, but these have not turned out as you had hoped. You may have had the dream to start a new hobby or project with the view that it would lead to something bigger, but you realise that you took the wrong approach and it isn’t pointing to the growth and development you had expected. The Page of Wands reversed invites you to reconnect with your original vision or idea and look for alternative ways to express it. Just because you didn’t succeed the first time, it doesn’t mean that the concept is wrong; it may merely be the execution that is out of alignment. Instead, choose another way to express the idea, and be prepared to redefine your path to stay in alignment with your personal growth goals. The Page of Wands reversed can indicate that your eagerness to start something new has been hampered by complexities, obstacles and opposition, which has resulted in a lack of motivation and indecisiveness about your path forward. You may also worry about whether you can get your project or idea up and running, or if you are just going to be weighed down by more responsibility and troubles. You may be allowing limiting beliefs and inner fears and anxieties to get in the way of achieving your dreams.